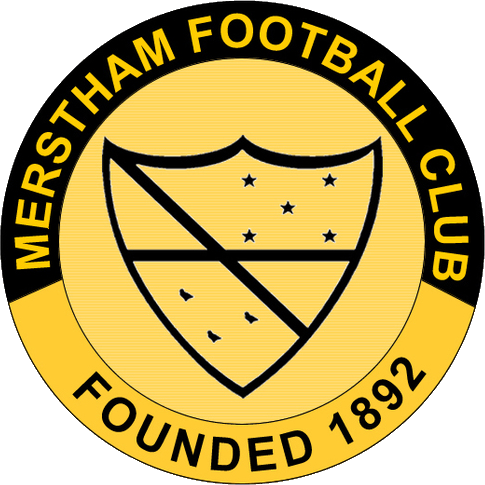 Merstham were founded in 1892, becoming founding members of the Redhill & District League five years later. In 1927, 1935, 1936, 1950 and 1951, the club won the league title, moving up to the Surrey Intermediate League after the 1951 title win. They won this league at the first attempt, before moving up to the Surrey Senior League in 1965. The club went on to win this league at the end of the 1971/72 season, before moving across to the London Spartan League in 1978, then moving across to the Combined Counties League in 1984 to cut down on travelling costs. They finished runners-up in this league at the end of the 1987/88 and 1989/90 seasons, before being moved up into the league's Premier Division when a second division was created in 2003. 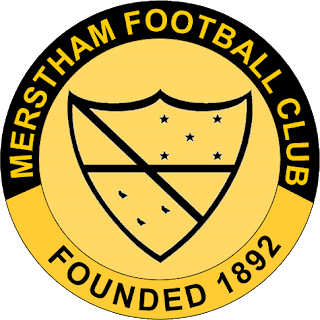 This change in the structure of the Combined Counties League soon saw success for Merstham, with consecutive runners-up finishes in 2006 and 2007 before claiming the title at the end of the 2007/08 season, losing just one league game all season. 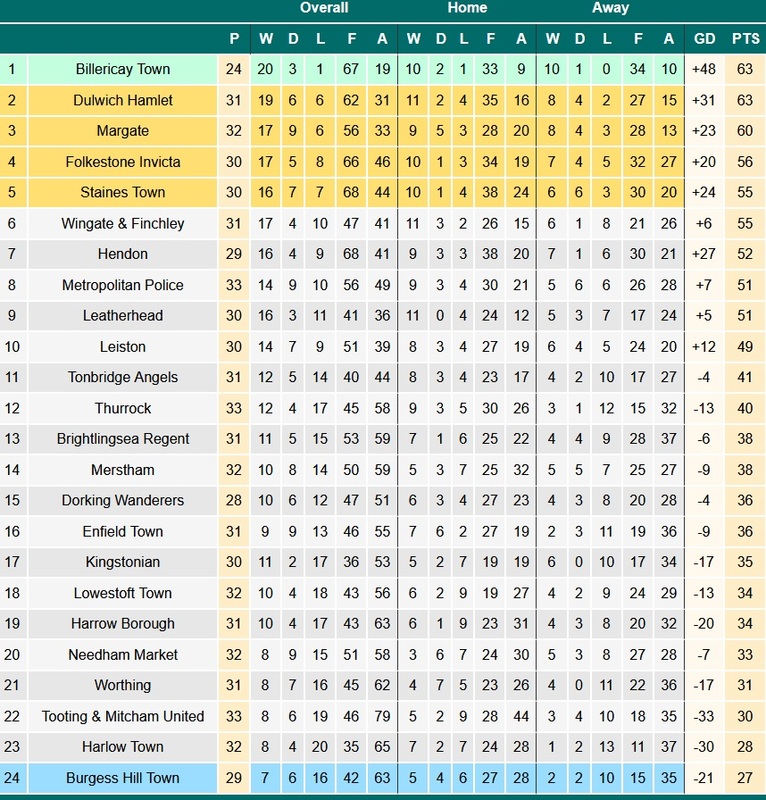 This title win saw Merstham promoted to Division 1 South of the Isthmian League. After a few seasons of mixed finishes - including a relegation scare in the 2010/11 season - the club finished 4th in the 2014/15 season and entered the play-offs. In the semi-finals, they beat Faversham Town 5-4 on penalties before beating Folkestone Invicta 3-0 in the final to earn promotion to the Premier Division, where they have remained ever since (in their two complete seasons at this level, they have had respectable finishes of 10th and 14th respectively). In the FA Cup, the club's best run came last season when they reached the 1st Round, beating East Preston, Colliers Wood United, Thamesmead Town and Ebbsfleet United before losing at home to Oxford United in front of a bumper crowd. In the FA Trophy, Merstham have progressed as far as the 2nd Qualifying Round on four occasions, most recently last season when they beat Waltham Abbey before losing 3-0 at home to Hythe Town. In the FA Vase, the club's best run saw them reach the Quarter Finals in the 2007/08 season, beating Dorking, Christchurch, VTFC, Pickering Town and Consett before losing to Needham Market. Originally, I had intended for yesterday to be a break from groundhopping, with money running a little lower than I'd like and with 2018 having so far been disappointing in terms of the games I've seen (barring last weekend's FA Vase game at Thatcham Town). However, yesterday morning, I ended up deciding that I wanted to go somewhere anyway, as I'm not feeling burnt out from groundhopping again just yet (I've not yet reached that point again like I did two months ago). So, with a decision to go somewhere being made, the next thing to decide was where to go. Initially, the game between Metropolitan Police and Billericay Town stood out, but I decided to start as local (and cheap) as possible first. However, with the rain coming down again, many of the most local options were less than appealing, with long walks from the station to the ground for Knaphill, Camberley Town and Cobham, and closer options like Leatherhead and Chertsey Town falling victim to the weather. With time running out for me to make a decision, I had a quick look through the Groundhopper app to find any other local options and, upon doing so, saw this game. I was somewhat interested, as being able to watch Step 3 football for a fiver was an appealing prospect, although not quite as appealing as the game at Met Police sounded. However, with Met Police's pricing structure not being clear (or, to be more precise, available anywhere online), I decided to leave my final decision to a quick poll. There wasn't much in it, but the poll had spoken, so I quickly ordered my train tickets, had lunch and then headed out. The train journey was another easy and relaxing one, with just the one change at Redhill (and some lovely scenery on the way, thanks to the murky conditions) before arriving in Merstham around ten minutes before 2pm. The walk from the station to the ground should have only taken 10 minutes, but because I got lost a couple of times on the way, it ended up taking 15 instead. However, this still meant I was in the ground for just after 2pm and, with plenty of time on my hands, I paid £5 for admission and £2 for an excellent programme before doing a circuit of photos in the rain, after which I grabbed a burger from the tea bar behind the main stand (it was acceptable for satisfying my hunger, but nothing special otherwise). I then settled in the back of the main stand as I awaited kick-off. 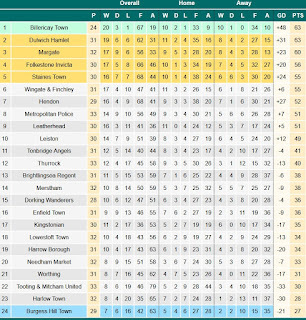 Looking at the table, both teams were comfortably mid-table, with only Leiston really having anything to play for as they could still feasibly reach the play-offs (Merstham are in a position where they're unlikely to go up or down, especially with just the one relegation position this season). As such, I was expecting a close game, but I was still hoping for a few goals here and there to spice things up. Chances were few and far between, with both sides mostly playing around with the ball in the middle, with some fancy passages of play but absolutely nothing of substance in the final third. 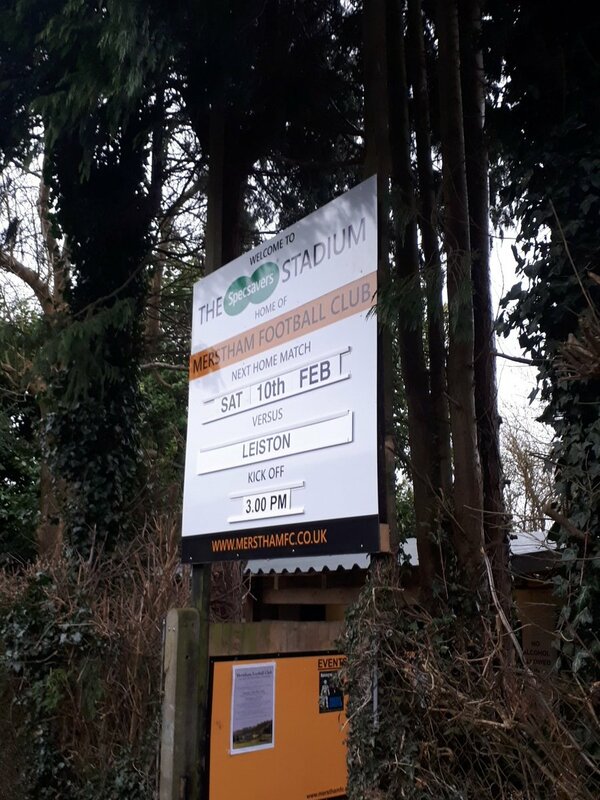 As such, it was unsurprising when Leiston missed their penalty on 47 minutes but it was surprising when they put the ball in the net after 59 minutes, only for the goal to be disallowed for offside. The only goal of the game summed up the quality of the contest as a whole, with Merstham's Liam Harwood bundling the ball over the line after a goalmouth scramble from a corner. Honestly, a 0-0 would have been a fair result, as neither team were good enough to deserve to win. On the bright side, despite the conditions, both teams were focused on just playing football rather than kicking each other, which allowed the game to flow for the most part (it's just a shame there wasn't much quality to go alongside this). 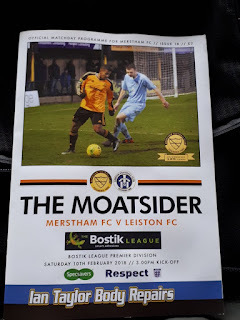 Also, Merstham's Tayshan Hayden-Smith (the number 11 in the photos below) was the best player on the pitch, and his moments of quality made the game slightly more tolerable at times. Overall, while the game was largely a damp squib (and continues a disappointing trend of few goals in 2018, with my current goal average for the year now less than 3 per game), it was good to get out of the flat and tick off another new ground and another friendly club. Here's hoping the goals start to flow wherever I find myself next weekend, though. Moatside is a pretty good ground, one that seems to have slowly and steadily developed as the club have grown and risen up the leagues, but with few other grounds at this level visited, I can't make a statement on how good it is for Step 3 (I'd probably consider it better than St. Ives Town's ground, at least). There are three areas of cover at the ground, most notably the main stand on the near side, which I would say has a seating capacity of 150-200. There's another smaller stand (called the Albury End) behind the far goal, with seating for a further 70-80 people. There's also a narrow covered terrace behind the near goal, providing standing cover for around 200 or so people (it's similar to the covered terrace behind the far goal at Godalming Town's ground, just a bit longer than that). The rest of the ground is open hard standing, with reasonable amounts of room to expand on both sides if the need ever arises, although the ground is perfectly sufficient for the club's current league standing and current crowds, so that may not be an issue anytime soon. 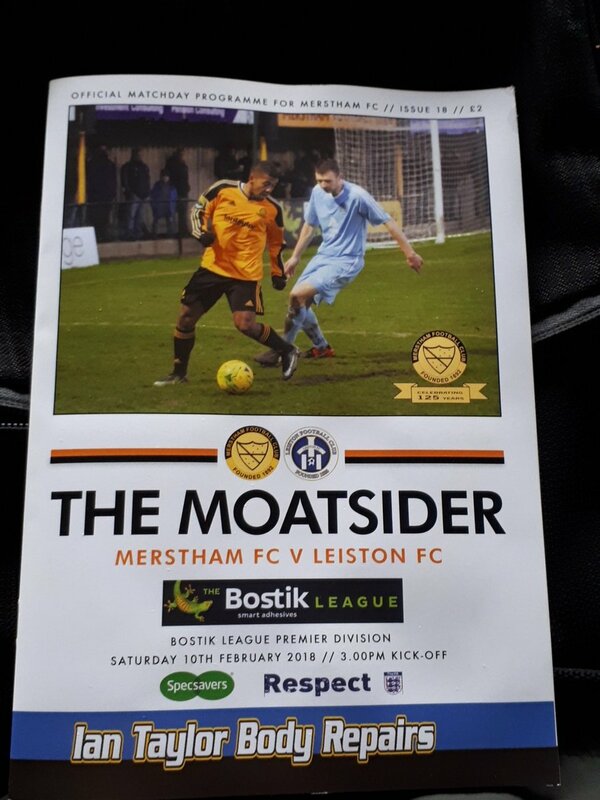 The ground has an overall capacity of 2,500, with the record attendance being 1,920 for last season's FA Cup tie against Oxford United, with Oxford's chairman then donating their share of the gate money to Merstham, money which I'm sure has gone a long way for the club.